Low and impaired vision is estimated to affect 1 in 5 people over the age of 75 in the UK and 1 in 2 over the age of 90. Types of visual impairment vary widely and include blurred vision, loss of visual field, loss of central vision and double vision. Finding a suitable phone for somebody with visual impairment can be a challenge. What may suit one person may not be right for another. Bright and large smartphone screens may help someone with a partial visual field loss but not be suitable if you suffer with blurring which can occur in cataract sufferers. Although many phones are now touch-screen, button based models are still worth considering. Look out for large, well spaced, raised and concave buttons, with good contrast and clear print or illumination. A tactile marker on the number 5 can also be helpful. A phone with a large display will be easier to use if you have low vision. Almost all displays are colour, with adjustable brightness, contrast and font size. AMOLED and Super AMOLED which stands for active-matrix organic light emitting diode and is a technology which allows for screens with much higher colour contrast and low power consumption. They produce very dark blacks and intense colours. Some manufacturers have there own brand names for the screens such as Clear black and Retina display. Memory speed dial is where a frequently used telephone number is programmed into a phone, so the user can dial it with one or two button presses. Voice dialling features can be very useful, here the phone recognises a name when you speak it, and then automatically rings the number from your contact list. Smartphones are getting bigger in terms of screen size, but thinner overall. It's worth finding a phone that isn't too small to hold or find inside your bag. Most phones tend to have screen sizes of around 2.2 inches, and smartphones range from 3.5-5.0 inches. Phones come in different shapes and this can affect how they function making some styles better suited to the visually impaired. 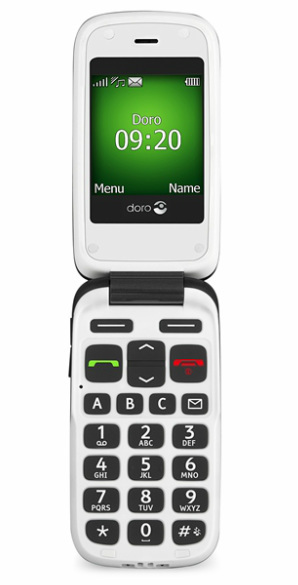 A flip cover phone that opens to answer and closes to hang up is perhaps the easiest design for people with sight loss. Some phones have an 'any key answer' capability, and some have an obvious answer/hang-up button with a sound signal. An important feature for hearing aid users. Look out for mobile phones that are rated M3/T3 or higher, meaning they will work with most types of hearing aids. Some phones offer functions to help you feel more secure such as easily activated emergency dialling and pre-recorded SMS alerts, etc. Near me – find places of interest – everything from bus stops and cafes to the local zoo. Georgie has been developed by the not-for-profit organisation Screenreader and is available exclusively through a partnership with Sight and Sound Technology. Buy a smartphone already pre-packaged with the system built in.